BARCELONA—Ready to put the Internet of Things where your mouth is? (Sorry.) 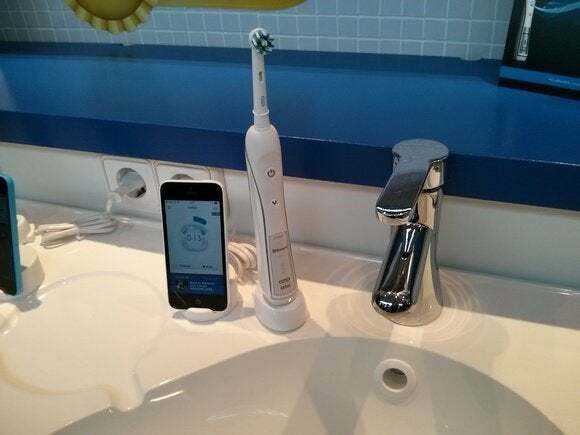 We were intrigued by the Kolibree smart toothbrush prototype at CES, but at Mobile World Congress, we brushed up against a connected toothbrush from Oral-B that will probably beat it to market—it’s scheduled to ship this June, at least in Europe, and should arrive in America later in 2014. The Oral-B SmartSeries Bluetooth 4.0 toothbrush pairs with a really well-designed app (iOS at first, Android later) that times your brushing session, encouraging you to go the whole recommended 2 minutes: that’s 30 seconds for each quadrant of your mouth. Once that time is up, optional “focused care” settings can remind you to target any problem areas your dentist thinks need extra attention, as well as prompt you to floss, rinse with mouthwash, and even clean your tongue. If you do all that (and of course you will), you’re rewarded with achievement badges, and the app has neat graphs that show your brushing stats over the days, weeks, and months. The toothbrush’s pressure sensor even knows if you’re pressing too hard, flashing a red light on the handle and a prompt in the app to ease up a little, there, tiger. Unlike the Kolibree, which lets multiple family members send brushing data to the same app—with different brush heads, of course, ew—to turn dental care into a competitive, gamified experience, Oral-B’s brush is meant for one person, at least for now. It rolls out in June, staring in Europe, with a suggested retail price of around $219, although it might go lower depending on the retailer. Of course, healthy teeth and gums are priceless.